Ok,i thought id post some shots of the cookware ive bene haulin with me in the woods for about yar now,and i havent been disappointed many times :). This is just one set up i like,it aint the only i have,but its the only gas gartridge powered i have now,as i sold,due to empty wallet,my two other gas stoves @ last winter. 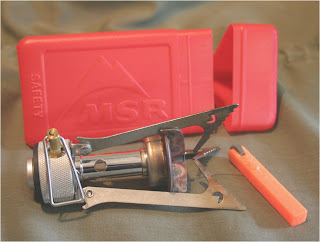 - MSR Pocket Rocket gas burner/stove. 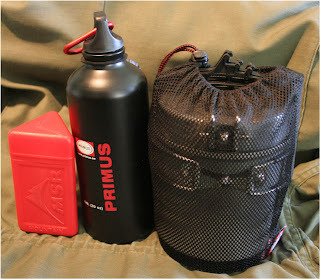 -Primus Etapower pot, 1.0 liters capacity. 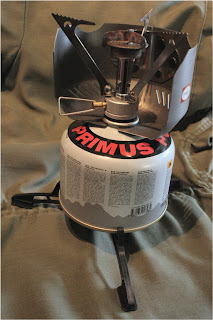 Youll notice maybe,that im pretty much equipped wih Primus brand gear.Thats only due to nice pricetags attched to them,and cause i like the price/quality ratio of them.I used to use Primus Techotrail II burner too,it was good cause it dropped nicely into the pot itself,and made the whole set-up more compact when all packed up in my rucksack.But that was then,before i,moron,went and sold it,but i had to. So after that i managed to grab one of these popular MSR pocket rocket´s an di have to say,that it has only two things i kinda miss.The forst is that its bit larger than technotrail,making it too big to pack inside pot,but i think i can bear with that,and survive.The second minus point...kinda....id give to Rocket,is that its lacking the piezo-ignition device,so i have to remember to always carry some method of throwing spark or fire to get the burner goin. Other than that im happy with my burner,its compact,yet durable to its size/weight.Although i dont care about weight of my gear so much,im chasing always for long lasting stuff,more than that hi-tech,li-tech stuff,but hey,different strokes for different people. The pot is regular Primus pot,from their ETAPOWER line up.So it has these heat transfering ribs/fins in the bottom of it,that that really aint marketing departement lie,that it makes the boiling time shorter as it seems to do so,it boils cold water to rolling boiling in minute or two,depending the climate/weather where you use it. The Teflon treatment it has,also is tough,and will serve you well for a long time especially if you dont go and use those sharp edged titanium,aluminium or steel sporks and other utencils to scrape scratches into teflon coating.So just keep on using wood or plastics,man,it´ll save your hard earned money on the long run. The lid of pot acts as small,more like tiny pan,but its ok for frying some small game,bacon,fish or even eggs.Its packing a nice locking handle too,with swivel in it,for compact size and form.Oh,the pot too has this two piece out-folding handle,good enough. Many burners do fit inside pot,but it all depends also if you like to pack the gas canister in the pot or not,so if youre lookin out for compact system,try to stuff your gear in the shop,inside the pot,but inform the shop staff about your acts so they dont see you as a thief stuffing gear inside the pot :). Pot has this mesh made fabric pouch with drawing string,its pretty well made,but i know mesh pouches tend to grab in the bush,they collect small branches etc,but it also is good as it dries out fast and lets you see if everything inside the pouch is ok.No complaints from me. Windshield i grabbed from local big market,it was used in promotion/reviews or something so got it for the half of the MSRP price,althogh it aint so expensive usually either,just some...14 Euros i keep remembering.Its very simple,just two bigger shielding parts,joint together by one riveted,small piece of flexible stainless steel,that acts as attachment point of gas canister´s neck.It just clamps around the neck of can,and has this tension,to keep it in place.No small parts to break or get lost,10 points for that. 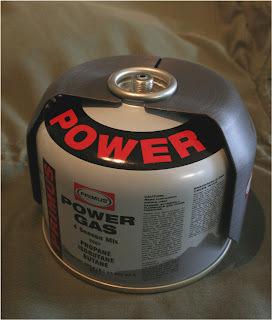 When you carry it,just fit the shield over can,as it attaches to it thatways,and fits over can pretty nicely,wont take any space and fits inside the etapower pot,maybe inside other brand pot´s too,who knows,i dont.And when youre preparing to cook,just flip it around,and its ready to block the windblows and other elements.Nice little,ok priced gadget to ease out us on the hunger. Spork´s just a simple two headed Primus SPoon-fORk-Knife combination,just with added swivel in the handle,to make it smaller.But also it is most certainly making it less durable.But i thought id give it a go,as ive also breaked many LMF Sporks in two pieces. 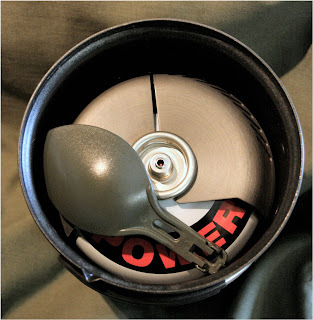 The bright orange item in some pic is a devive for giving a spark to light up the burner.Its from AMK´s small pocket survival kit,just basically small wheel and spring loaded flint,as found in cheap gas lighter,zippos etc.Its most propably Sparklite brand. The gas can stand & support gadget is also from Primus if i remember correct,its just a nice plastic made three piece gimmick that opens up and spreads,and forms a three legged support,to make the whole cooking set-up bit more stable especially in rough surface.The complete kit when in use is more like small tower,it sure aint the lowest one,its more like Jetboil set up,that aint stable either but this suppport makes it bit better,and ive noticed that it good at winter if you place some insulating thing on top of packed snow,and drop a handwarmer jelly-pack on that insulating item,maybe a glove or small piece of mattress,and then pile up the gas can,stove etc,on top of these,and it will make the burner run good as the support keeps it stable,the insulation part prevents the handwarmer heatloss,and the warmer keeps gas can in good + temperatures.At your own risk,man,as theres a lot of different handwarmers,some are way too hot and might make the can explode even. 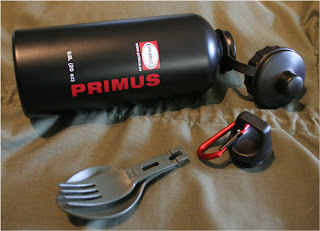 And last of all,the bottle is 0.6 liters Primus aluminium bottle,nothing special,just a simple one with anticorrosive coating inside,and two lids,the sport type with sipping valve and the othe ris more reliable,non leaking screw on type,attached with small red carabiner.This one i havent used at all yet,and im plannig on using it Just for spare-water containing,or just for pure cooking water,not for all around drinking water. This kit is is what i choosed and i can recommend it without hesitation to anyone intrested in bit smaller gear,as it fits in a small daypack as well,doesnt weight much and it is of a good quality. 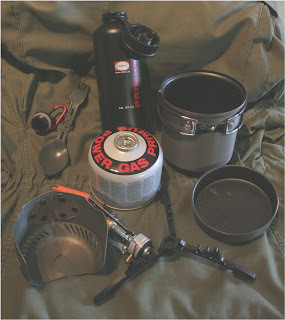 Offcourse,if youre planning on kit used much in the cold winter climates or very long trips,i must say that then you gotta realise that gas cans must be kept warm,insulated,with those disposable small handwarmer jelly packs or otherways,to keep gas in form of gas,do not let it turn into freezing liquid or it wont burn,it just spills and spits,if it even ignites.And you must carry cans enough to make it thru your explorations.So do consider carryin a alcohol burner,like Trangias are,too,theyre extremely reliable and trustwothy,though big and heavier gear.But even a small kettle with handle allowing it to be hung above open camp fire,is good Just-In-Case item to be taken along with you.You always have to think the season of the year,the weather,fauna and landscape,distances to nearest shops,refill points etc before steppin into that path.Preparation is the key,i think. I have the same MSR 'Pocket Rocket'. It's a great little stove.